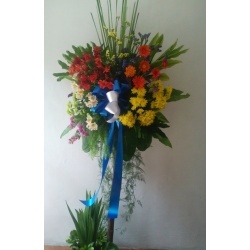 For occasions celebrating love, friendship or romance, send your heartfelt wishes with this gift package at an affordable price of only $98, It is an exotic arrangement of only the freshest 2 dozen gerbera of excellent quality, in a vase. 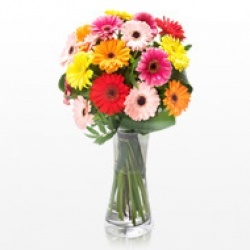 Gerbera, which originated in South Africa, stands for cheerfulness and exuberance. 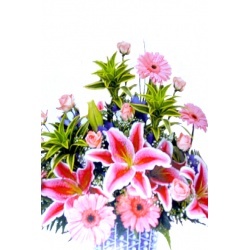 This gift package is ideal for occasions for Floral Bouquets and occasions for Gerbera. Gerbera signifies cheerfulness and exuberance, making it perfect for joyous celebrations of love, friendship, or romance. 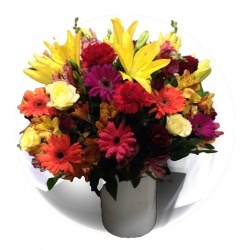 Send your warmest wishes with this gift package that comes at a pocket-friendly price of only $65, It is an exotic bouquet of 1 dozen gerbera of only the freshest, choicest quality, wrapped elegantly. 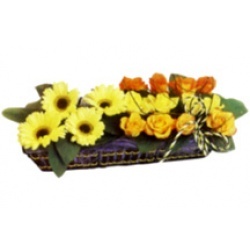 This gift package is ideal for occasions for Floral Bouquets,Mothers Day, occasions for Gerbera, and Get-Well-Soon occasions. 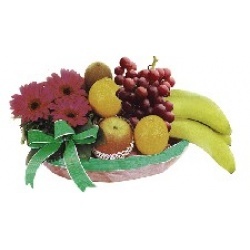 consist of 6 gerberas , a small bear and a box of cookies arranged in a basket. 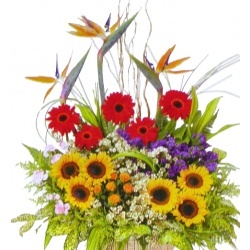 A spring arrangement consisting of gerbera, birds of paradise, roses and sunflower in a basket. 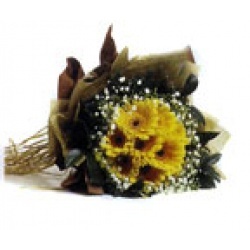 note: some variety of flowers may not be available at the time of order, a substitute of equal value will be used. The color yellow signifies clarity, perception, understanding, and wisdom. Cheer loved ones see the light at the end of a difficult time with yellow flowers of spring. Gerbera stands fro cheerfullness.